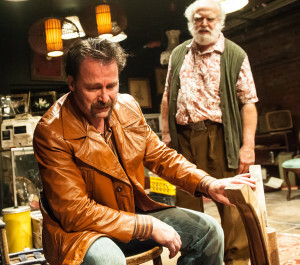 “Unexpected” is probably the best descriptor for Quill Theatre’s production of David Mamet’s American Buffalo at TheaterLab. This unconventional experience began as we descended the stairs to the basement of 300 E. Broad Street to a door that advertised Don’s Resale (don’t let the construction out front misdirect you). Only by peering through the door’s glass and spying the audience were we able to see that this was indeed a theater and not a junk store. Entering the space felt even more like we were going consignment shopping. Really? Did someone plop a stage in the middle of Goodwill? Vinnie Gonzalez definitely made it feel that way. The stage is really a 360-degree rendition of a resale shop decorated with close to a thousand props for what is probably the most realistic stage I’ve ever seen. From used jewelry to lampshades to rugs, I felt ready to take out my credit card, no, cash only for that lamp with the scrollwork shade and red light bulb. 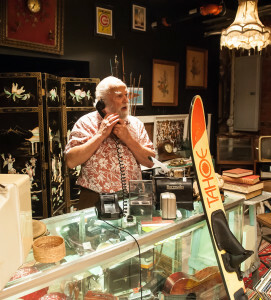 The proprietor of the junk store is kindly grandfather-type Donny, portrayed faithfully by Alan Sader. Visitors include Bobby (Jesse Mattes) and Teach (Jeffrey Schmidt) who, on initial impression, seem to be Donny’s withdrawn teenager grandson and 1970s urbanite customer, respectively. As the play evolves, we learn that this deceptively benign tableau belies a trio of dark lives, motivations, and intentions. This subtle depiction of the hard-scrabble life is adeptly directed by Daniel Moore and skillfully executed by these talented actors. Each concomitantly brings the hard edge of society’s underbelly, blended with an unexpected and almost inexplicable humanity. Though the story is somewhat understated, the language is not: This play is best-suited for mature audiences. American Buffalo from Quill Theatre is running through November 1 at TheaterLab.